This is my favorite dish to get at the food court Chinese restaurant. And this version is even better. It's easy to whip up even on a weeknight and is loaded with lots of good vegetables. 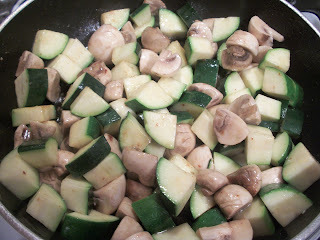 If you are blessed with an abundant zucchini crop, consider making this - I promise you won't be sorry. 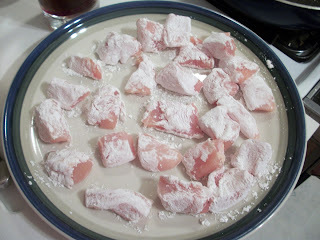 Start by cutting up the chicken into bite sized pieces and then dredging them in cornstarch. 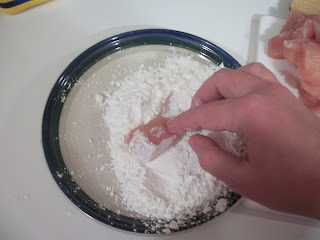 This gives the chicken a nice, crunchy coating when it's sauteed. 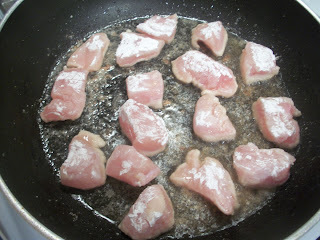 I like to dip all the chicken in the cornstarch before starting the stir fry. Just line them up on a plate and you'll be ready to go. Now heat the vegetable and sesame oils in a large skillet or wok over medium high heat. 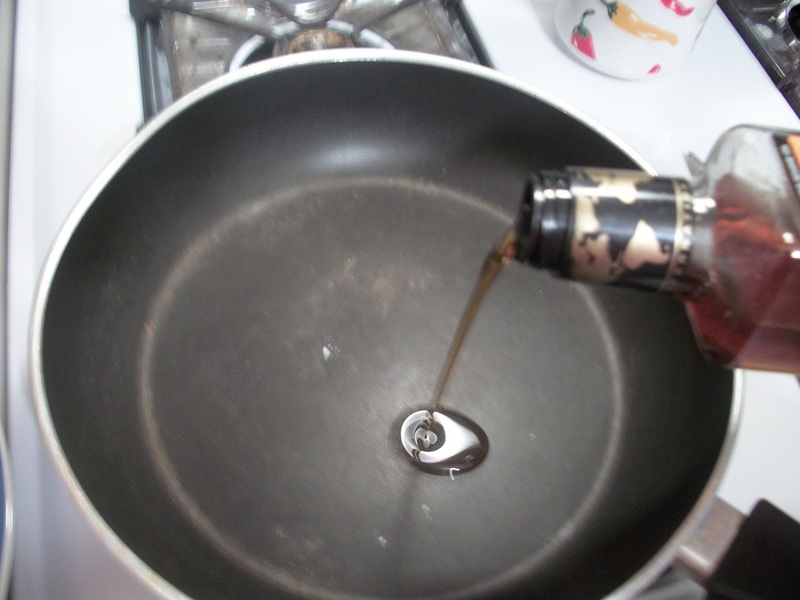 When the oil is hot, add the chicken and cook for 2-3 minutes. 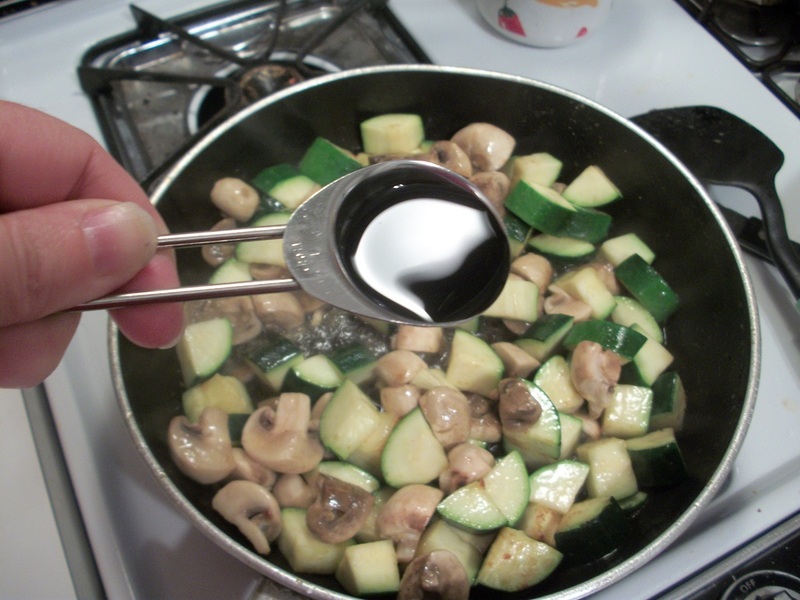 Carefully turn over and cook an additional 2 minutes or until the juices run clear. 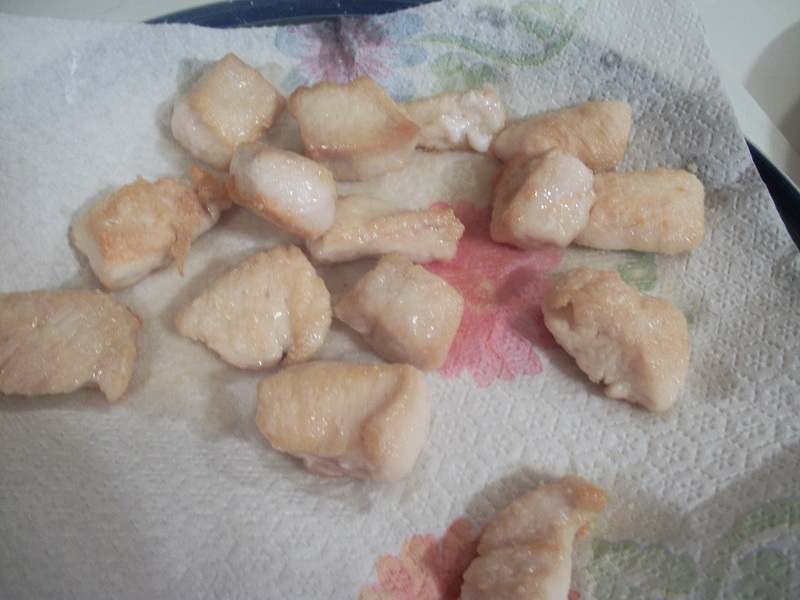 Then remove the chicken to a paper towel-lined plate. 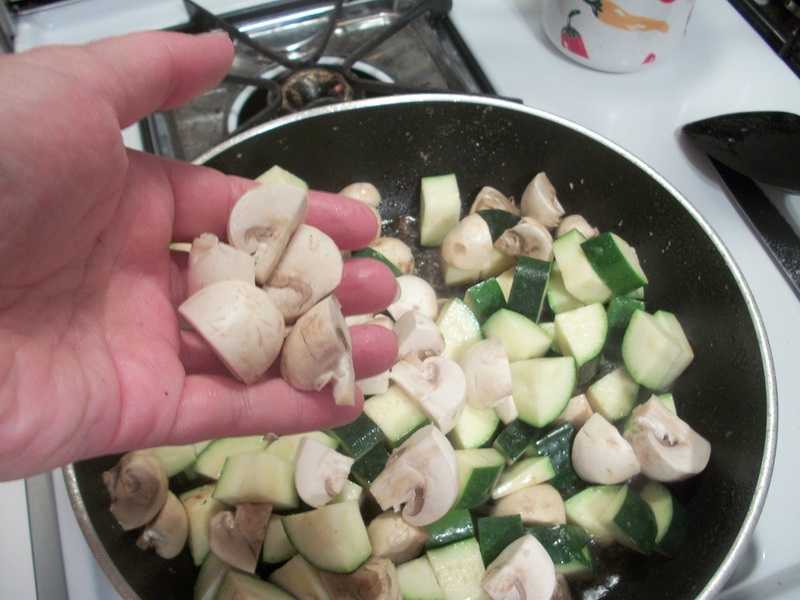 and the mushrooms to the same skillet. and ginger. 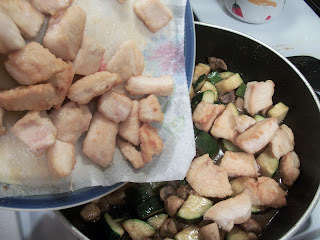 Stir to coat the vegetables, then add the chicken back to the pan. Stir again to coat the chicken with the sauce, and cook and stir for just a minute til the chicken is heated through. You will find more recipes at Recipes to Run on, Tasty Tuesday, Tempt my Tummy Tuesday, Tuesday at the Table, Delectable Tuesday, Tasty Tuesday (#2), Tasty Tuesday (#3), Made from Scratch Tuesday, What's Cooking Wednesday, Real Food Wednesday, What's on the Menu Wednesday, What's on your plate, Made it on Monday, Cast Party Wednesday, Foodie Wednesday, Recipes I can't wait to try, It's a Keeper, Full Plate Thursday, Recipe Swap Thursday, Pennywise Platter, Turning the Table Thursday. Lightly dust chicken pieces with cornstarch until lightly coated. Add oils to a large skillet or wok and fry chicken pieces until golden brown, turning once. Remove and drain on paper towels. Add zucchini and mushrooms to the wok and stir fry for 2-3 minutes, scraping up any chicken bits in the pan. Add soy sauce, balsamic vinegar, garlic and ginger to the skillet and stir to coat and stir fry until mushrooms and zucchini are fully cooked (about 1 minute). 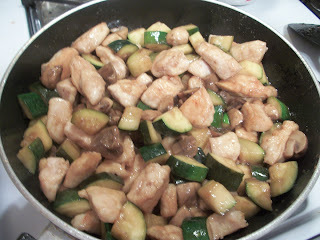 Return chicken pieces to the wok and stir until coated with sauce and heated through. Serve over hot rice. Serves 4-6. I too order a similiar dish out when I go to our mall's food court. I like the idea of making it at home instead and how much healthier it will be. Yummy! Hi Elena Blthe! I found your recipe through Beauty and Bedlam's Tasty Tuesday ... my recipe is the one right after yours and it's a Thai dish. 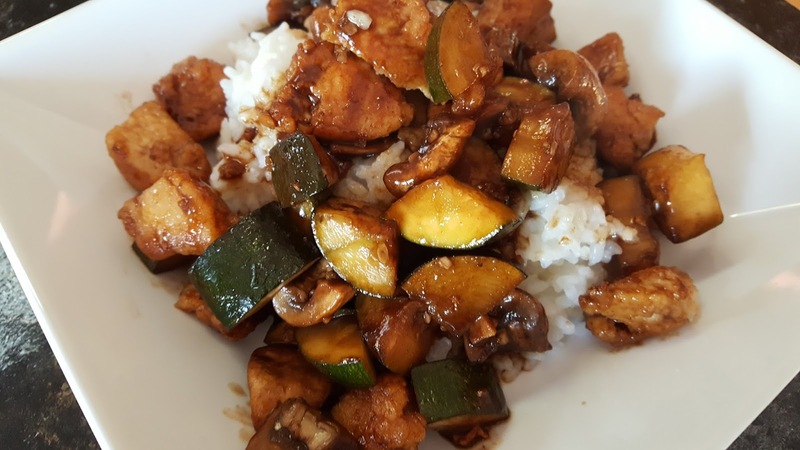 I love Asian cuisine, so I'm excited to give this recipe a try. Thanks for sharing! I love the combination of chicken, mushrooms and zucchini! 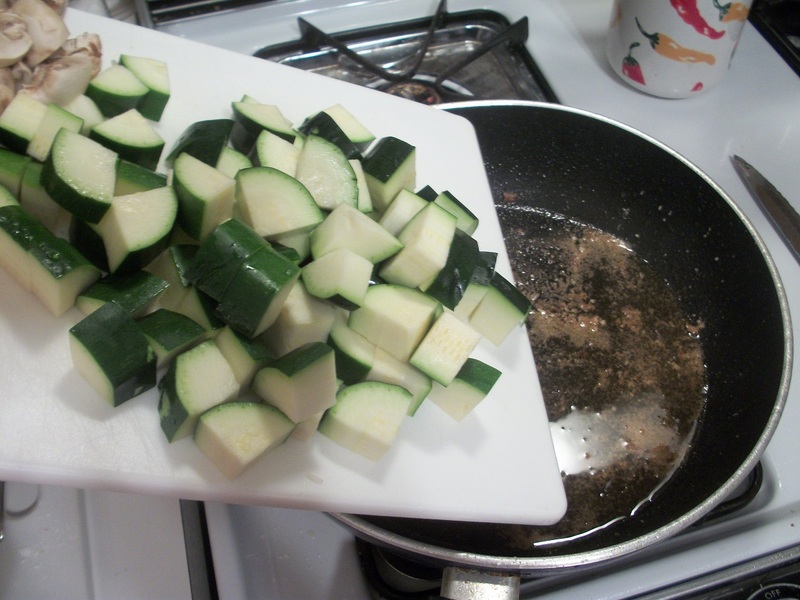 I often make a similar dish with both green & yellow zucchini... It's easy & everyone loves it! YUM YUM YUM !!!! This looks totally yummy! Now I can make it my favorite too! This is my idea of the perfect dinner. My family would love this recipe. Great pictures. Come over and visit us today. We have a recipe for a wonderful chilled summer soup and a give away from the Fairy Hobmother. We have so much Zucchini from our garden right now, this will be a perfect recipe for us to try. It really looks delicious! Thank you so much for sharing with Full Plate Thursday and come back soon. Have a great week end! YUM! I love duplicating restaurant dishes at home! This one looks great! Oh my goodness. It's one in the morning, and I should be going to bed, but instead I'm looking at your delicious food and my stomach is grumbling - because, well, there's NOTHING better than chicken! I (surprisingly!) have all the ingredients for this, and will totally be making it in the morning! Do you make your own balsamic vinegar garlic or is that something that you buy? 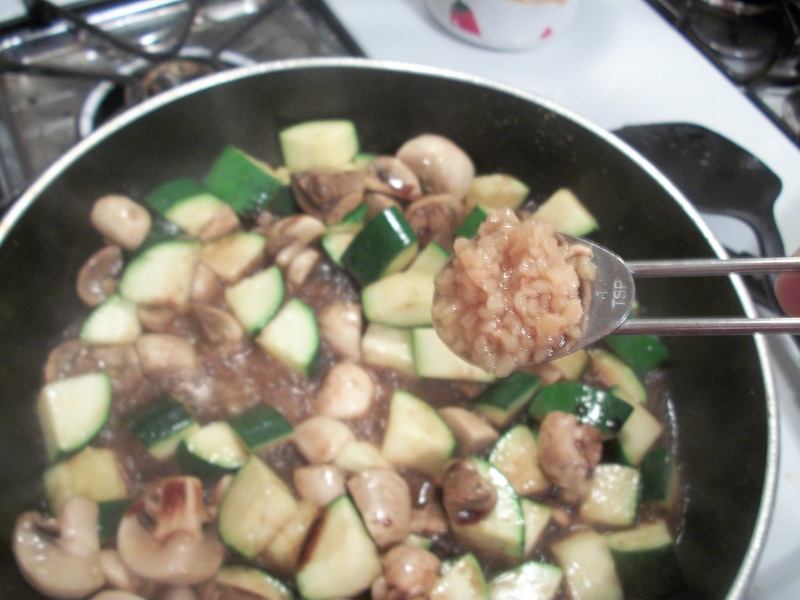 Burbank - those are two different ingredients - balsamic vinegar and garlic. I hope you enjoy this dish!